Ukraine's Prosecutor General's Office (PGO) has announced that the Council of the European Union has prolonged sanctions against Ukrainian lawmaker Serhiy Kliuyev who fled from the country until March 6, 2016. "The European Union Council's resolution No. 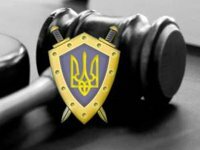 2015/1777 dated October 5, 2015 has prolonged the restrictions (sanctions) against Ukrainian MP Serhiy Kliuyev until March 6, 2016," the press service of the Prosecutor General's Office reported. As reported, Kliuyev is suspected of committing crimes under Part 3 of Article 209 (transactions on a large scale with property, which was obtained as a result of a socially dangerous act that was preceded the legalization (laundering) of proceeds, as well as actions aimed at concealing and disguising the illegal origin of such property and rights to such property), Part 5 of Article 369 (bribery) of the Criminal Code of Ukraine," reads a statement posted on the website of the Prosecutor General's Office. On June 3, 2015, the Verkhovna Rada gave its consent to Kliuyev's prosecution. On June 9, Kliuyev was placed on the international most wanted list, Ukraine's prosecutor general Viktor Shokin said.